Pre-vetted Gold Coast solar installers in the Queensland SolarQuotes network are listed below. To get free no-obligation quotes for solar panels from 3 of these installers, enter your postcode in the box on this page. You’ll then be on your way to receiving details and pricing of an electricity bill-busting system designed according to your needs, requirements and circumstances. Living up to its name, the Gold Coast is, like much of Queensland, blessed with abundant sunshine. The City of Gold Coast has been setting a good example of making use of this valuable resource; generating solar electricity to reduce its reliance on the grid and to slash its power bills and emissions. Projects include grid-connected solar panels installed at Southport Broadwater Parklands and the Nerang Library. Other smaller solar power systems are used by Council around the City at locations such as water quality monitoring sites. The City of Gold Coast is also considering installing floating PV arrays throughout its network of wastewater ponds in order to further reduce electricity costs, and is rolling out solar panels across its waste and recycling centres. City of Gold Coast has a long relationship with renewable energy, dating back to 1977. Its pioneering attitude to PV has been reflected in the number of home solar power systems being installed by many of its half-million plus residents seeking to reduce their electricity bills and do their bit for the planet. A good quality 5kW system properly installed in the Gold Coast region can generate on average a bit under 18 kilowatt-hours of electricity a day – that’s a little more than the daily average in Australia for household electricity consumption. The percentage of Gold Coast households with solar energy systems installed on their rooftops is higher than the national average. Postcodes in the Gold Coast region often feature among the top ranked for PV system installations in Australia. There’s more than one way to follow the sun as Gold Coast residents and their council have shown. 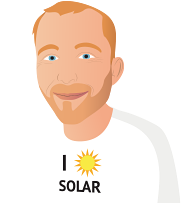 If live on the Gold Coast, you can join the people-powered PV revolution by harvesting the energy from the sun from your own rooftop – get started by submitting for a quote from up to three carefully pre-vetted solar installers participating in our network.